Those of you who remember Pizza the Polar Bear might remember why he became famous. He was known as the "World's Saddest Bear" because he was once housed at the Grandview Aquarium in Guangzhou China. A pathetic excuse for an animal park located within a shopping mall. The aquarium has been called a "living hell" and for good reason. The beluga whales, which were caught in the wild and forced into a life of captivity, live in a plain tank with no stimulation. They're only outside interaction comes from the trainers and paying customers for whom they are forced to perform. The seven-spotted seals don't fare much better. They also have little to no stimulus and seem to exhibit behavior that suggests the animals are utterly bored with their existence. For seals and whales, marine mammals that usually have a vast ocean to call their home, being forced to live in an empty tank in a dimly lit facility is absolute hell. Finally, as activists point out, the aquarium further endangers these animals well-being because of its location. Defying logic, the aquarium isn't located on the ground floor, so if there is ever a leak or worse, not only the animals but the people below could be swept away. 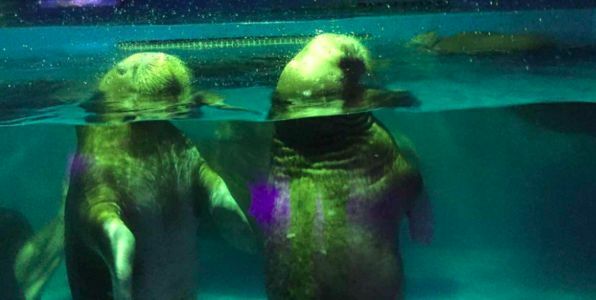 Sign and share this petition and ask the the city of Guangzhoe to seize Grandview's animals, give them to a sanctuary and shut that aquarium down.